So back to bronze sculpture in question. All branches of the US Military have mascots, they range from bears to eagles, and mules to…yes, bulldogs. Additionally, many individual units have their own mascots based on their unit’s nickname. The United States Army, III Corps, is known as the “Phantom Corps” a nickname they earned during World War II, for hitting the enemy when they were unprepared. The unit is made up of modern mechanized ground and air cavalry (tanks and helicopters). Back in 1985, General Crosbie Saint first had the idea to pair up Frazetta’s artwork, with his own units Phantom Corps/Phantom Warrior nicknames. 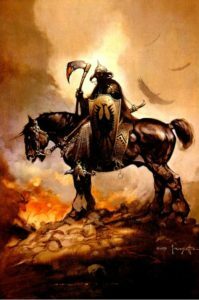 The following year an agreement was reached between III Corps and Frazetta to use a slightly modified “Death Dealer” image, as its symbol. 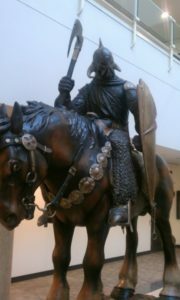 Based on a recommendation by Frazetta; the statue was created by Deep in the Heart Foundry, in Bastrop, TX. 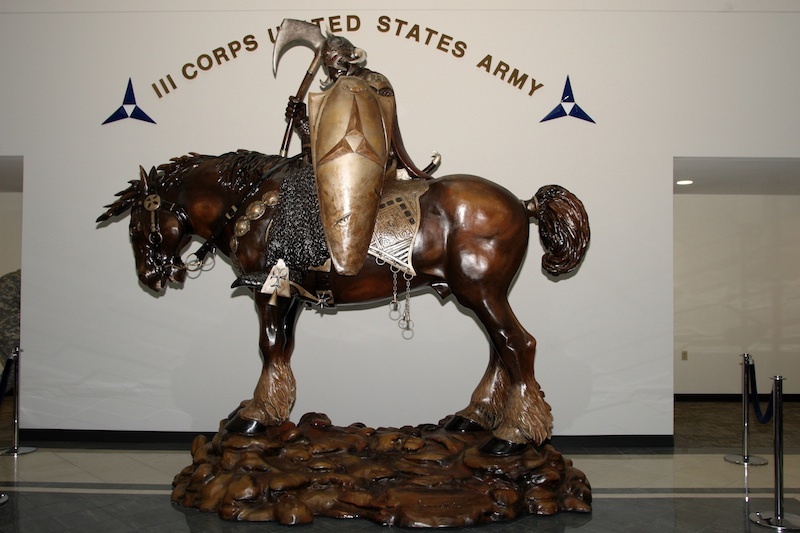 The final product is an 18-hand tall (about 6 feet) Shire draft horse, mounted by a menacing, armor clad, 6-foot 6-inch warrior, in a horned helmet; and weighs in at 4,600 pounds. The only major change from the original artwork is the symbol on the shield. In the original, the shield sported what appears to be a gryphon or eagle; however, on the statue, the shield now shows the raised III Corps insignia. 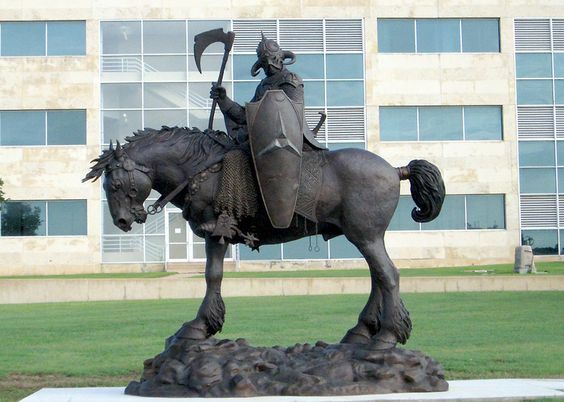 It was installed on June 2, 2010, right outside the III Corps headquarters building at US Army Base, Fort Hood, Texas. Unfortunately, Frank Frazetta Sr. died on May 10th, 2010. In total, there are three Phantom Warrior statues. The one of bronze, that was discussed above; and two smaller fiberglass statues. One sits inside the West Atrium of the III Corps headquarters, and the other can be disassembled and accompanies III Corps on its many deployments around the world. My Daughter was, and Son-in-Law is currently stationed at Fort Hood, attached to III Corps, I got the see the statue first hand, and it is (in the true sense of the word) awesome. 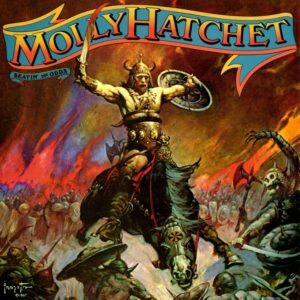 Note: Frank Frazetta Sr. has a son, Frank Frazetta Jr. during the research for this article there were conflicting reports as to whom worked with III Corps on this project. There was a rather nasty legal battle between Sr. and Jr. regarding the rights to Sr.’s artwork. For the sake of this article the name Frazetta is used interchangeably.